And so the league title is almost certainly bound for Madrid after a fine 2-1 win at the Camp Nou. With recent clasico’s providing a fair dose of play acting, melee’s along with a very high degree of technical quality, this game was something of a disappointment, missing all of those ingredients which make them such gripping viewing. It was tense and the crowd were subdued for much of the game. As were the technical areas. Mourinho stayed sitting for most of the game, he would have been extremely happy with how things panned out whereas Guardiola never showed any urgency towards his team. After clawing back the deficit from 10 points to 4 points, perhaps he knew it was just too much and the team could not sustain the level of effort required any longer. Guardiola is known for throwing a curveball in his selections and tactics for clasico’s but I doubt anyone saw his selection or formation in advance. Tello and Thiago starting with Pique, Fabregas, Sanchez, Pedro and Keita on the bench. 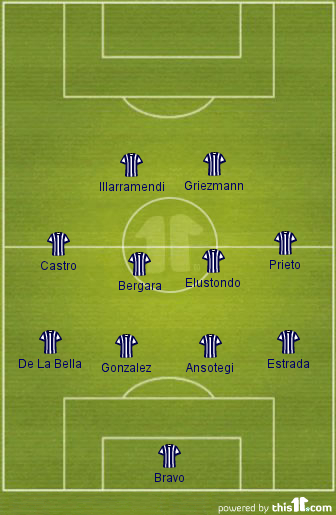 Cuenca did not even make the squad. A 4-3-3 when defending but switching to a 3-3-4 when in possession and moving forward. As I had suggested in the preview, Puyol initially tracked Ronaldo meaning Dani Alves started higher up the pitch on the right. On the opposite flank, Tello provided the width. 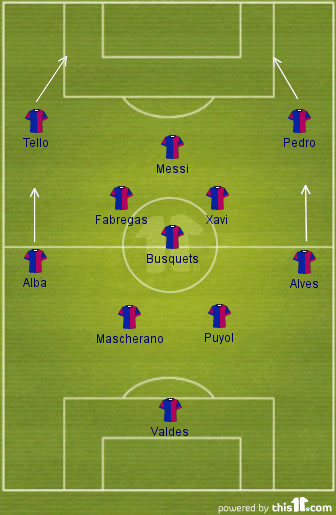 Thiago operated at the base of midfield with Busquets moving between midfield and central defence as required. Mourinho kept faith in the team which lost to Bayern and went with his usual 4-2-3-1 formation resisting the temptation to switch to a 4-3-3 and adopt a more conservative approach. Madrid did not press as heavily or as coordinated as they have done in previous clasico encounters. The front four were pressing but nowhere near as aggressively and the remainder of the team were dropping off. This “false” pressing from Madrid was adversely affecting Barcelona though as they made a number of forced and unforced errors in their passing. Have Busquets, Thiago and Iniesta ever made so many incomplete passes in the same game? This was a game that Barcelona had to win to keep alive their hopes of winning the title. The onus was on Barcelona to take the initiative whereas Madrid would have been content with a draw. As such, all of the interesting features arise from a Barcelona perspective. Nothing that Madrid did was unexpected or unusual. They did their jobs very well with discipline, organisation and a high workrate. With Messi dropping deep and Tello and Alves wide, there was no player to occupy the Madrid central defensive pairing of Pepe and Ramos. Subsequently, when Messi took possession and tried to run with the ball, he was easily crowded out centrally. Barcelona enjoyed 78% possession but much of it was in a central area and in front of the Madrid backline. Busquets, Thaigo, Xavi and Iniesta were all central and only on a few occasions did anyone break further forward ahead of the ball offering a passing opportunity into the Madrid penalty area and pulling the Madrid defence. Too often the passes were across the pitch. Barcelona needed much more vertical movement from their players and in this respect the late arrival of the subs was very surprising. How much has Barcelona missed not only the goalscoring of both Pedro and Villa this season, but the movement and finishing that they offer? Dani Alves played the entire game as a right winger and had little impact on proceedings. The strength of Alves is when he breaks from deep and at pace, attacking the opposition full back and also providing an overlapping outlet for Barcelona and linking with his team mate higher up the pitch e.g. his link play with Messi previously and now with Sanchez. On his own and from a standing start, he is not going to beat his opponent so Barcelona were left with Alves on the right, either failing to get around Coentrao or turning back inside. There were also a number of occasions in the first half when Alves received the ball wide right and no Barcelona player was near him. Each time, Alves was forced to turn back infield. If Sanchez or Pedro had received that pass, Alves would have been overlapping and providing an outlet. Barcelona have played a slightly more direct fashion at times this season due to two key factors. 1. Sanchez and Fabregas are willing to make more vertical runs, particularly Sanchez coming from out to in and off the shoulder of the deepest defender. As a consequence, Barcelona will look for both players more often and play slightly riskier passes as a result. 2. Xavi has missed some games due to injury. With Xavi, no other player in the Barcelona squad can fulfill the same role. Without his controlling and measured approach, the other midfielders will play more direct passes. The removal of Xavi after 68 minutes has been misinterpreted in some quarters. Xavi has been struggling with an Achilles injury for some time. He is also severely fatigued now. This has implications not just for Barcelona but also for Spain at the Euro’s. Also, that Messi was more effective, making the run which led to the goal after Xavi was removed, has also been misinterpreted. The removal of Xavi and the run from Messi are not related. The introduction of Sanchez was key. He occupied Madrid’s central defenders and pulled Pepe wider when Messi broke allowing him enough space to drive towards the Madrid penalty area. The goal resulted after a few deflections. Focus on the Champions League? Mourinho went with his strongest eleven. It was clear were his priority lay. For Guardiola it is not that straightforward. Tello made only his third senior start and Thiago at the base of midfield was also unusual. Why not Keita who provides a stronger presence? Why does Pique remain on the bench? Fabregas and Sanchez were clearly being rested ahead of the Chelsea game. It’s an extremely risky strategy which could backfire if Chelsea manage to emerge from Tuesday night with a positive result. In the clasico preview here, I listed 5 key factors which I considered would have an influence on the game. Madrid surprisingly kept the same eleven who had started the game against Bayern and the team performed well including Di Maria who put in a considerable defensive effort. If anything, it was Barcelona and Xavi especially who looked tired. Yes, for the first 25 minutes or so they pressed and held a relatively high defensive line. At 1-0 up, they dropped deeper and looked for quick counters. Madrid continued their recent direct approach both in terms of hitting some longer passing and also by moving directly towards their opponents goal when they won the ball. Barcelona are always much more considered when the regain possession. Ronaldo did his share of defence duties and also scored the winning goal. All in all, a very successful night for him. And they did with 78% to Madrid’s 22% but as at Stamford Bridge, the possession was in a comfortable zone for their opponent. Barcelona passed and passed in front of the Madrid backline. The use of Tello and Alves high and wide failed. Tello in only his 3rd start showed glimpses of his pace but against a deep backline, he could produce little. Alves, as outlined above, is not a winger.